In Harvest of Gold, the scribe Sarah married Darius, and at times she feels as if she has married the Persian aristocracy, too. There is another point she did not count on in her marriage-Sarah has grown to love her husband. Sarah has wealth, property, honor, and power, but her husband's love still seems unattainable. Harvest of Gold takes place a few months after the ending of Harvest of Rubies. We are brought right back into Ancient times following Sarah, the former chief scribe to the queen of Persia and her husband Darius, second cousin to the king. Sarah and Darius' marriage didn't start off the best, but they are trying in their own ways, but for their own reasons of self preservation it has proven tricky to say the least. They are friendly to each other, but they still don't understand each other. Sarah has proven to be an asset to Darius with her skills she had acquired as a scribe. They can work together well when it is a business matter. Harvest of Gold does not just focus on Darius and Sarah, but also Sarah's cousin Nehemiah. As cup-bearer to the king, Nehemiah is also an adviser to the king of Persia is usually in-tuned to that of the court, but before any of that, Nehemiah is a Jew and worships God with all of his heart. In the past few months, he has had an urge to help in some way his forefathers home of Jerusalem. He knew the temple had been rebuilt, but the reconstruction has not progressed the way it should have. When discussing with the king, Nehemiah offers to go. The king allows it and makes him governor of the area, while he is there. In the travels, the king also wants Darius to go. After a recent assassination attempt, the king wants to have everyone responsible in hand and dealt with and clues lead to the area of Damascus, which is close to Jerusalem. Sarah can't believe the news and is desperate to go. However, the trip proves to be a great risk emotionally and physically. It was another enjoyable story! 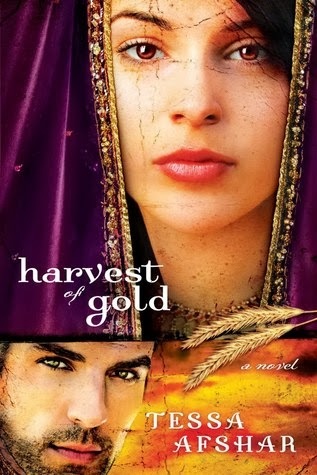 Harvest of Gold was as fast paced and full of mystery as Harvest of Rubies. I wonder though it this is the end of the series. I felt at the end that there could be more to the story or even a spin off with two minor characters. I would like to see more of Lysander! 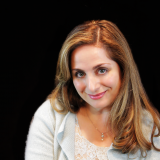 Tessa Afshar was born in Iran, and lived there for the first fourteen years of her life. She moved to England where she survived boarding school for girls and fell in love with Jane Austen and Charlotte Bronte, before moving to the United States permanently. Her conversion to Christianity in her twenties changed the course of her life forever. Tessa holds an MDiv from Yale University where she served as co-chair of the Evangelical Fellowship at the Divinity School. She has spent the last thirteen years in full-time Christian work. Thank you to Moody/ River North, I received a copy of this book for free in exchange for an honest review. I definitely agree there could be a spin off and I kinda hope there is one day :) I liked them both! !